Now there’s nothing complicated about making a Niçoise salad, but there’s a fair amount of prep that goes into it. We’ve got lettuce to wash, a vinaigrette to make, eggs to hard-boil, veggies to blanch, potatoes to cook, and tuna to sear. I promise it’ll be worth it and your dinner companions will likely be so delighted by your salad that they’ll stick around to help with the dishes. Once you’ve got everything prepped, compose your salad. It’s fun and you’ll feel like an artist. You could divide everything between individual plates but I dig the look of a large, family-style platter–it’ll make dinner feel like a party, even if it’s not. Spread large lettuce leaves around the outside of the plate and layer on blanched asparagus and wedges of potatoes. Drizzle with a lemony vinaigrette and sprinkle with herbs and sliced shallots. Peel and quarter your eggs and nestle them in among the potatoes. 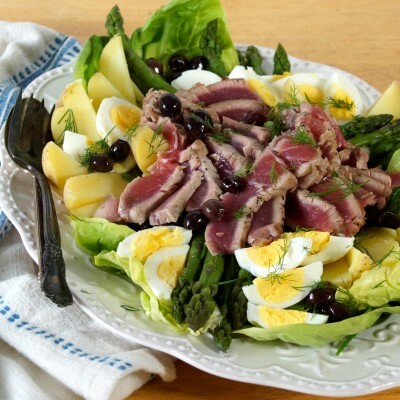 Season, sear, and slice your tuna, then fan it out atop the salad. Scatter a handful of tiny purple olives around the platter, and call everyone to the table. 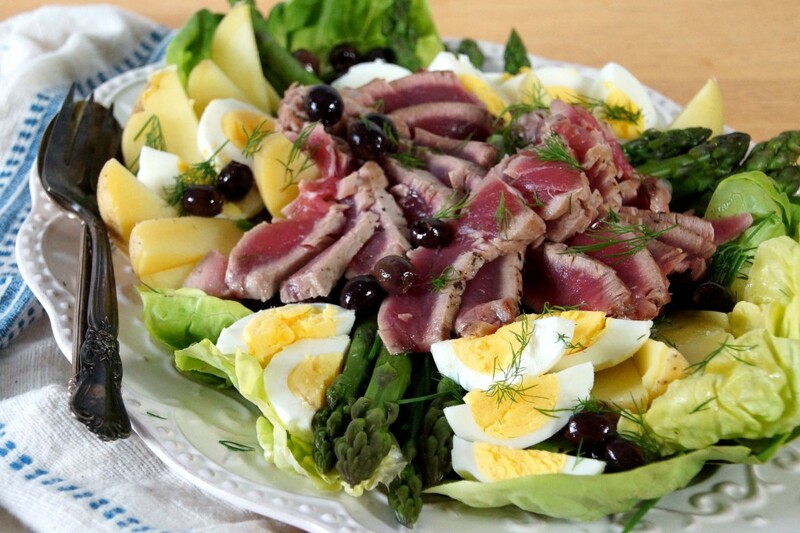 This is a very green, spring-time version of the traditional Niçoise salad. As we head into summer, feel free to trade out the asparagus for the more traditional green beans, whatever herbs are popping up in your garden or market, and wedges of juicy, ripe tomato. 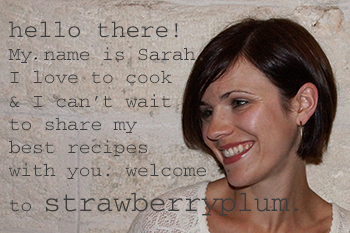 Be creative--as long as it's ripe and fresh, it's going to be good! Boil the potatoes until just tender. Cool and cut each potato into 6-8 wedges. Hard-boil the eggs. Place eggs in a medium saucepan. Fill with water to cover eggs by 1 inch and add a pinch of salt. Bring to a boil, then remove from heat and cover for 10 minutes. Remove eggs from pan and transfer to an ice bath to cool for 5 minutes. Peel and cut into halves or quarters. Blanch the asparagus. Place the stalks into boiling, salted water (I reused the potato water). Boil until the spears are bright green and crisp-tender, about 3 minutes for medium-sized asparagus. Remove and plunge into an ice bath to stop the cooking and cool completely. Make the vinaigrette. Combine lemon juice, mustard, and olive oil in a small lidded jar. Shake well to combine and season with salt and freshly ground black pepper. Begin to compose the salad. Place the lettuce leaves on the bottom of a large platter or 4 individual plates. Arrange the potato wedges, asparagus, and eggs on top. Drizzle with about half of the vinaigrette (save the rest to pass at the table) and scatter with the herbs and shallots. Sear the tuna. Season each steak with salt and pepper. Heat about 1 Tbsp. olive oil in a large frying pan until very hot. Sear about 1 minute per side for rare tuna, a bit longer if you like it more well done. Thinly slice against the grain. 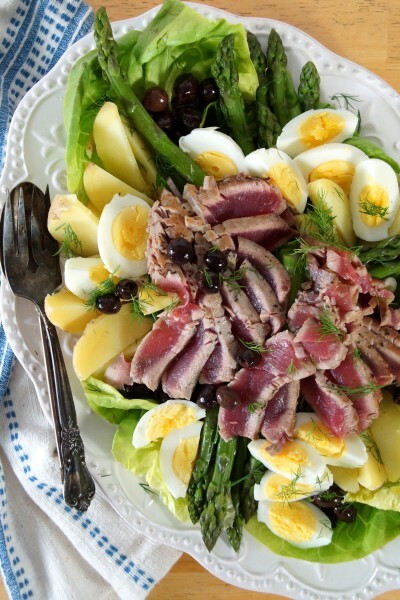 Fan the sliced tuna out over the salad. Place the eggs on the salad and scatter the olives over the top. If you're not a fan of tuna or just in the mood for something different, this salad would be delicious made with salmon as well. Wow!!! Beautiful presentation and fantastic pictures. I can only imagine how fantastic it tastes..